Sundaes to Stop PSP raised nearly $9,000 for CurePSP’s programs and services! 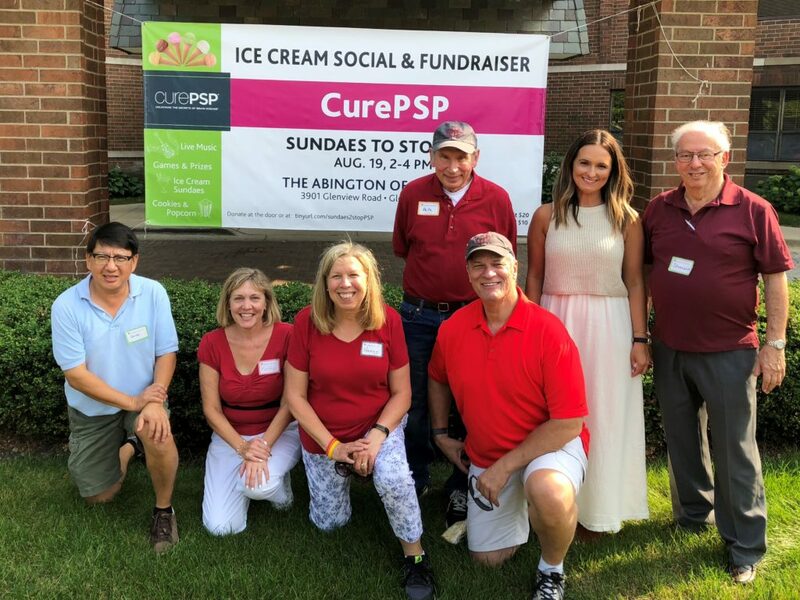 The Glenview, Ill., CurePSP Support Group held our inaugural fundraiser on Aug. 19, an ice cream social called Sundaes to Stop PSP, which increased awareness of progressive supranuclear palsy (PSP) and raised nearly $9,000 for CurePSP’s programs and services. Our 25-year-old group regularly attracts 10 to 25 people with PSP and their carepartners/family members to its monthly meetings in a north suburb of Chicago. As the only CurePSP in-person support group in Illinois dedicated to PSP and its related prime of life neurodegenerative diseases, our group draws members from the Chicago area and neighboring states. When a group member last year suggested we hold a fundraiser to fight this terrible brain disease, some of us wondered if we could find the time and energy while living with PSP or caregiving and, for many of us, holding full-time jobs. Because we all wanted to raise awareness of a disabling disease that even many members of the medical community are not familiar with, a few of us formed a planning committee, with me chairing it. Wanting a fun event that all of us could participate in, the support group voted to hold an ice cream social to benefit CurePSP. Our goal was to raise $3,000. We were amazed at the generosity of our group members, family, and friends, which allowed us to nearly triple our fundraising goal. More than 125 people attended the event, including two speakers during a brief program. Diane Breslow, MSW, LCSW, a social worker and consultant who serves on CurePSP’s Patient and Caregiver Advocacy Committee, offered hope through the availability of CurePSP programs, such as respite services. Deborah Hall, MD, Ph.D., an adult neurologist, and movement disorder specialist at Rush University Medical Center in Chicago, spoke of the realistic hope of finding an effective treatment through research. The support for our community was palpable. Perhaps it was the delicious ice cream and other donated treats, the great door prizes we raffled off or the entertainers who gave their musical talents, but many people stayed the full two hours of the open house. When we were short-staffed at the registration desk, several paying guests quickly jumped in and helped us check in guests. Some attendees thanked us for organizing the event and requested that we hold it again next year. Personally, by taking action in hosting a special event, I felt I had more control in dealing with this uncontrollable disease. Use social media to spread the word and collect money. We used an event planning website (Eventbrite.com) for tickets to the ice cream social and a fundraising website (everydayhero.com) for other donations. Both platforms allow posting to social media sites such as Facebook, which we did multiple times over several months. Most of our donations came through these platforms. Even small donations add up when many people are giving. If you aren’t a “techie,” find someone who is, to manage the platform. Ask each support group member to invite at least 10 people. Invite even people you don’t think will come to your fundraiser because, often, they will donate. Also, send the event flyer to local medical centers’ movement disorders clinics. Ask vendors to donate food, materials, and the use of their facility. Go in-person, be friendly and stress to the owner or manager that you are trying to raise as much money as possible for a good cause. Don’t suggest a small gift because the vendor may be willing to give more. A free or low-cost venue and minimal costs for food, drink, and entertainment mean more money raised. Allow six to 12 months to plan. Our committee met monthly for six months. We assigned multiple volunteers for each event station (food serving, parking, etc.) ahead of time to cover all areas. Early in the planning, find out what your state’s laws are on soliciting funds for a charity and on raffle prizes if you plan on a raffle. Work with CurePSP.The events staff at CurePSP is experienced and willing to help you. They also can put a link to your event site on the CurePSP website. Contact Jaclyn Zendrian at 347-294-2831or Zendrian@curepsp.org. Kathleen Louden is a freelance health writer and editor. With her husband, who has PSP, she has belonged to the Glenview PSP support group for five years.